I'm very partial to the Amarr as well. The Armageddon is this fantastic hatchet-headed shape, like something out of a swords-and-sorcery-in-space fantasy epic. Love it. I am also extremely enamored of the Curse, a wedge of black and deadly awesomeness, though I wish it was a turret ship rather than a drone boat. It looks like it should be a HAC. I also love the Caldari Rokh. It is one of the few battleships in EVE that looks like a proper space battleship should look, blocky, slab-sided and mean. Same goes for the Phoenix-class dreadnought and to a certain degree the Chimera-class carrier. Along this line I have a certain affection for the Charon as well. My favorite ship design in EVE, though, is unquestionably those alien beauties, the Thanatos and the Nyx. Techno-organic Gigeresque nightmares, they have a visual style that I wish more ships in EVE would emulate. In my short experience so far, I've grown quite fond of my catalyst, Tensegrity (pictured on the top of my blog). I know it doesn't have the best rep—not great at much of anything but level 1 missions and salvage—and she doesn't tend to win the beauty contests... But it takes guts to rock a radically asymmetrical ship like that. I think it's really beautiful when it makes a sharp turn and goes up on its side, like it has aspirations of being a Myrmidon but can't quite make it. Poor girl. Best looking ship? Well, I'm partial to the Chimera of course, and the Rokh. Caracal is sweet. But I have to admit its the Merlin and variants that I wish I could fly exclusively. I like most of the Amarr ships, but for overall "oooooooooo" factor, I love the Angel Dramiel. Too bad you have to ruin its lines when you slap guns on it. I'm rather fond of the Blood Raider's Ashimmu cruiser's looks as well. I really like the look of the Khanid ships, particularly the Curse. Actually I really wish the Pilgrim had that look, it seems more fitting for such a stealthy ship. I still love the Machariel too, esp. with the extra detail on the ship model now, but it was so much nicer in black. Cartel ships when it comes to faction, which is a rather obvious statement coming from me. For non-faction I admit a big motivator to crosstrain Amarr with Caldari was the pretty ships and the added convenience of Khanid using missile launchers. Had I been more of a gunnery person then Gallente would have won though. And I am glad to see in the comments I am not the only one that likes the looks of Caldari ships. Some models are a bit weird but their textures are really nice. Raven would be my fav there, or the drake. Overall fav? I'll vote Machariel. The Typhoon used to be named 'garbage can', but after the new graphics came out it ended up looking businesslike and functional. In fact, everything looks much better, but the Minnie ships gained the most I'd say - but of course they had now where to go but up. I guess in the end, as Antiquus said, every race has their beautiful ships. Beauty is in the eye of the beholder as they say. By the way, Anonymous, that's one mighty tough banana you've got there! Zit urs? I really like the Providence as well. My favorite combat ship is the Rokh. As someone else said, it just looks like a battleship should. 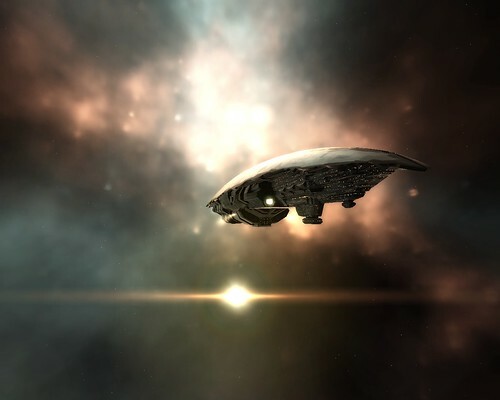 The Providence is actually my favorite looking ship in EVE as well, with the Nyx coming in a close second, and all in all, I'm with most people on thinking that the Amarr have the best looking ships overall. I started my main as Minmatar but quickly found myself not as enamored as I once was with their "scrap heap" appearance. I still find the Hurricane to be pleasant on the eyes however. But for my favorite ship out of everything, it has to be without a doubt the Navy Megathron. Hell any Megathron for that matter. It just has that imposing look of doom when you look straight into it. Wow, no love for the Minmatar fighting ships eh? The Rifter is the deadliest looking frigate in the game; the Hurricane takes a departure from most Minnie ships with its smooth, sleek lines. I'd vote for the Hurricane as easily the best looking sub-battleship in the game, but I'm biased. Unfortunately, our battleships leave a little something to be desired on the design side (and the pew pew side, but that's a different story). I can't believe no one has said the Megathron yet. Easily the best looking ship in the game if you ask me. Rifter is definitely a very cool looking little frig as well. I love the gigantic fireball that comes out of the engines when it flies. Nice pic! :-) And yeah the Providence is one cool ship! In my opinion it is actually the nicest looking freighter of them all. And yeah quite unfair it's "only" a freighter. Yes the Amarr do have nice ships. The Abaddon is my favorite. If I could go for any ship though just based on appearance, I particularly love the sinister, wicked look of the faction battleship, Nightmare. Just the sight of the thing sends devilish chills down my spine. There are some nice ships in each race and faction. I've always liked the Rifter, and it's still a first choice for me. I'll send some love to the Merlin too - nice looking little ship. One I want to own is the Firetail - I like its lines. For big ship wow factor, I'll go for the Nyx. Coolest looking? The Moa, duh! I think the Minmatar Carriers are pretty cool looking. I'm a frigate lover. The Dramiel and Firetail have been mentioned. I also like the Daredevil. I myself am partial to the Ishkur, with its Jousting Pole coming from the front.. The Vexor or Ishtar are pretty snazzy looking. Wow, Luccul...no idea how I managed to forget about the Firetail. That is one sweet little frigate! The hurricane is an amazing looking ship. It reminds me of a Star Destroyer in so many ways, which I thought was an unmatched design in sci-fi for beautiful looking evil. Apart from that, my favorite looking ship has to be the "tuning fork of doom" -- the Megathron. The thing is pure evil, and obviously takes inspiration from old muscle car design. Most Amarr designs are too phallic for my tastes tbh. I'm surprised so many people love their look. I must say I absolutely LOVE the Ark. The Hurricane is truly beautiful too. The Abbadon was always my favourite besed purely on its visual appeal. With its massive golden armour plating illuminated with purple fire as some unlucky target gets a full broadside it looks truly awesome. Recently though the omen navy issue has become my favourite looking ship. Its amazing the difference a re-skin makes compared to the standard omen! It just looks 'right' somehow. All races have amazing looking ships, and awful looking ships. These are my favourites. Amarr: Arbitrator and its tech 2 variants. Curse specifically, but the Arby is a little more lovable in an odd sort of way. Gallente: Easily the Nyx. There is no debate. Minmatar: Both carriers are nice, as is the hurricane. It's tough, but I prefer the hurricane. Caldari: Drake. EVE's friendly giant. Overall best looking race: Amarr. With the Arbitrator, Anathema, Harbinger, Apoc, Crusader and more, they take the cake. I think Gallente look the best. As for favorite ship... Proteus (only seen a couple) and Thorax. wow thats crazy! nice ship man. My favorite would have to be the Myrmidon. I love all of its finer details, and I especially love how it is tall rather than wide. It's gorgeous. Most tend to not like its looks, since it's basically a glorified mushroom, but it's a classic Amarrian ship: golden plate, curvy without being a total bulge with little parts sticking out that the other titans seem to look like, and its doomsday device is beautiful to watch. A close second for me is the Abbadon. Everything about it seems to scream "shiny tank." It has the classic good looks most ships of its race hold, but also radiates an aura of beefiness. It makes a great party crasher during a fight, in looks and other ways. And of course, who could forget the Amarr shuttle? 40 meters long and dangerous XD I named mine the Noisy Cricket.